I first tried Jo Malone Bitter Orange & Chocolate sixteen hours ago at Nordstrom. My usual policy is to wait at least a week before reviewing a perfume so that I can be sure that I haven’t missed anything, but Bitter Orange & Chocolate has no hidden depths to plumb. This perfume does what it says on the label. It smells like chocolates (milk, not dark- I’d estimate 40% cacao) filled with orange liqueur. I’m not sure if I’ve ever tasted a bitter orange, but there’s certainly nothing bitter or tart about the very smooth Bitter Orange & Chocolate. This is a relatively sophisticated chocolate scent, sweet without ever dissolving into a sugary mess. Bitter Orange & Chocolate is a simple, attractive fragrance. I consider it a perfectly good option for fans of the chocolate-orange combo. 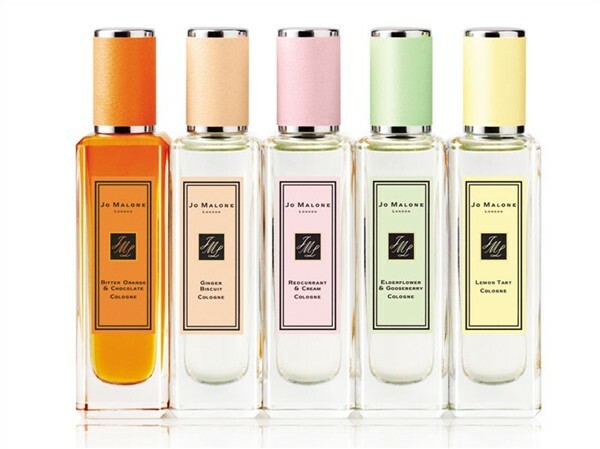 In general, I would say that the Sugar & Spice collection is weaker than Jo Malone’s 2011 Tea collection. Most of the effort seems to have gone into the (absolutely adorable) packaging. Bitter Orange & Chocolate strikes me as the standout, and it’s a solidly three-star perfume for me. Too bad I can’t try them. The pakagings are so happy and the scents sound lovely too. I would be happy to smell them even if they all turned out to be not suitable for me. The packaging is fantastic. I’m a little ashamed to admit it, but I have bought a perfume solely for the packaging before: Harajuku Lovers Jingle G. Of course, it was far below Jo Malone prices! I used to frequent a coffee shop in my grad school days called Clementine. Their signature drink was “The Clementine,” basically an orange mocha. It was good. I am sort of hoping that this perfume will evoke that drink. Anyone know of an orange-chocolate-coffee perfume? That sounds AMAZING. Maybe this would layer well with JM Black Vetyver Cafe! ooh, good call. I seriously want to go to Nordstrom and experiment with this idea. I’m testing Ginger Biscuit and (at least what I think is) Redcurrent & Cream. They’re both fairly linear, but nicely done and pretty. I’m leaning towards the Ginger Biscuit though I have to say, the Redcurrent & Cream is one of the nicer red fruits I’ve smelled lately, the sourness keeps it from being too ditsy. I sniffed all of them yesterday and I have high hopes for Elderflower & Gooseberry (that’s the one I meant to spritz), and Lemon Tart, if it lasts well, may end up replacing my near-empty decant of Carthusia Mediterraneo. Ginger Biscuit was my early favorite too. It must have been Redcurrent & Cream that you tried, nothing red berry-ish about Elderflower & Gooseberry. I want to try the Elderflower & Gooseberry. The others aren’t really calling my name but I may very well love one of them. Who knows? I liked Elderflower & Gooseberry, because it reminds me of the elderflower liquor in my favorite gin cocktail! Any chocolate lover would enjoy it, I think! Except for my mom, who called it “nasty”. Whatever, Mom! Bitter Orange and Chocolate smells wonderful! I want to eat it! I just don’t want to wear it. LOL! Thank you for reporting back, Undina! I’ve been curious about these scents, but will downrate my expectations accordingly now – a bit like the UK’s Triple Star Moody rating! Thank you for injecting some current events into my woefully uncultured brain- I’d never even heard of the Moody rating! Thanks for confirming what I kind’ve expected (but wanted to hope otherwise) about these. 😦 No pastel caps for me, I guess!